About the group How would you describe this image to somebody who can't see it very well? This group makes those amazing images talk! Library services at Home (Birmingham’s Home Library Service) have got together with some of their visually impaired members to discuss their memories and recollections triggered by the photos from the Britain from Above project. We have also added a few facts and dates for the project. Centre left of the photo is the Town Hall which is a large building with columns. This building was designed by Joseph Hansom, who later went on to design the Hansom Cab. The statue of Queen Victoria on New Street is just to the lower right of the Town Hall. To the left of the statue is the postal sorting office on Hill Street built between 1889 -1891 in the French renaissance style and was designed by the architect Sir Henry Tanner. Centre right of the photo is a large ornate building which is the Council House. Directly above you will find the Birmingham Museum and Art Gallery. Charlie from Billesley recalls the bronze statue titled “Lucifer” by Epstein. This was purchased by Birmingham City Council and was visible upon entering the gallery itself. Mavis from Bartley Green recalls working at John Plants shoe shop in Paradise Circus which on the photo is just behind the Town Hall. At the centre of the photo is St Philips Cathedral which has a baroque style and was built between 1709 –1725 by Thomas Archer. Behind the Cathedral on Colmore Row there is a very large building which is the Grand Hotel which was opened in 1875. Moving along Colmore Row to the right will lead to a white building which is the Prudential Assurance, it was previously known as the Blue Coat School up until 1930. 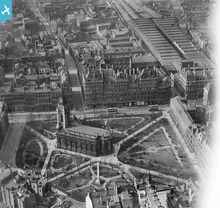 In the top right of the photo is the original Snow Hill station, this great western railway or GWR station opened in 1852. Moving left from the station you will find the Birmingham Eye Hospital which opened in 1883 and is behind the Grand Hotel. Betty from Hall Green worked for the Prudential Assurance for ten years. Her lunchtimes were spent in the grounds of the cathedral which we “Brummies” know as “Pigeon Park” and she occasionally had lunch in Kunzals coffee bar which was in Colmore Row. Betty also recalls her confirmation at St Philips. Stan Hubbard (narrator) I personally used to go train spotting in Snow Hill Station and distinctly remember the sunlight coming through the darkened glass roof windows and glinting on the shining brass bands and beautiful green livery of those majestic and mighty great western locos. 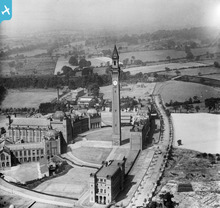 The main building in the centre of the photo is known as Cadburys which is in the Bournville area of Birmingham. 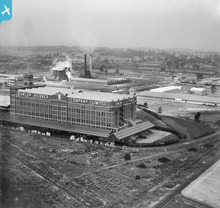 The Cadbury family opened the factory in 1879. 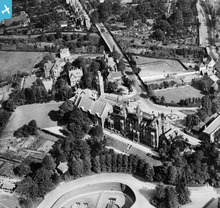 The top of the photo shows the sports field which was also opened by the Cadbury family in 1902. There is also a community hall for the employees to use. On the left side of the sports field is the Cricket Pavilion. Running centrally from left to right on the photo you can see the Worcester Birmingham canal which was used to deliver the cocoa beans for production in the factory. Just above the canal, looking to the right of the photo you can see the small railway lines also used by the factory. Mavis from Bartley Green, vividly remembers working at Cadburys where she would apply the decorative foil paper by hand to the chocolate eggs. 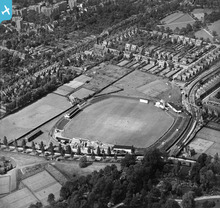 Directly in the centre of the photo is the cricket ground which originally formed part of the Calthorpe Estate. 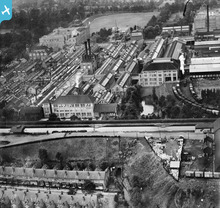 Edgbaston Road is directly underneath the cricket ground with Cannon Hill Park just visible at the bottom right hand corner of the photo. St Mary and St Ambrose Church is visible above the cricket ground and is located on the Pershore Road by the corner of Raglan Road. 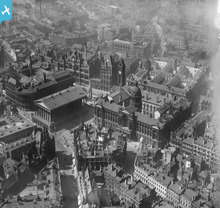 At the top of the photo moving left you will see some very distinctive buildings which were built in the 1930’s. These art deco style apartments are called Viceroy Close which are located on the Bristol Road. The top right corner just catches a glimpse of Calthorpe Park. Betty from Hall Green recalls the art deco apartments at Viceroy Close as her friend worked as a nanny for a well to do family who lived there. In the middle of the photo is an oval dog track. 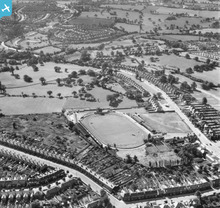 This was Kings Heath Dog Racing Track which has now gone and has been built over with an estate of houses called Wyndfield Gardens. Charlie from Billesley noticed Taylor Road at the bottom of the photo ‘there use to be a builder’s merchant called Taylor’s and they named the road after it’. On the right of the photo are some precisely planted trees which is the edge of Brandwood End Cemetery. Betty from Hall Green remembers going there every Sunday afternoon to visit her grandmother’s grave. Bishop Vesey Grammar School is the large building in the centre. Bishop John Vesey first established the school here in 1527. It is one of the oldest schools in Britain. In 1728 the Corporation provided more land for a new building in the current location. Marie from Sutton Coldfield said ‘the amount of open ground strikes me the most, every two years the scouts of Bishop Vesey perform a concert but it is in the winter, and the car park gets full of ice’. Library services at Home have (Birmingham’s Home Library Service) got together with some of their visually impaired members to discuss their memories and recollections triggered by the photos from the Britain from Above project. We have also added a few facts and dates for the project. This is a picture of Sutton Town Hall and King Edwards Square. The large building in the centre is the current Sutton Town Hall consisting of an 1865 structure and a 1906 extension. This was formerly the site of the Royal Hotel. The oval shaped structure at the bottom centre of the picture are the remains of a railway turn table which was used to turn around engine locomotives when Sutton Coldfield’s railway line only ran as far as Sutton Coldfield. Library services at Home (Birmingham's Home Library Service) have got together with some of their visually impaired members to discuss their memories and recollections triggered by the photos from the Britain from Above project. We have also added a few facts and dates for the project. The large building several stories high is the centre of the Dunlop manufacturing company and all the other buildings from left to right are also associated with the manufacturing of the Dunlop Company. Betty from Hall Green recalls cycling past the big imposing buildings on her way to see relatives in Minworth and she has vivid recollections of the wheels on her bicycle getting stuck several times in the tram lines that ran along the Tyburn Road. 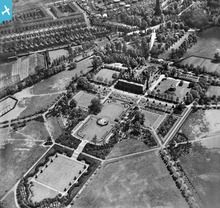 The centre of the photo shows a very big house surrounded by formal gardens. This building is Aston Hall and was built by Sir Thomas Holt between 1618 and 1635. 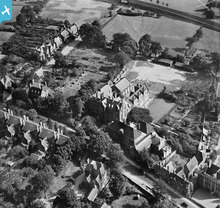 You can see a church at the top right hand corner which is known as Aston Parish Church. This church was built in the 14th century. Just below the church is the entrance to Aston Hall, noticeable with its stone archway and just above and to the left of the church are the roofs of the travelling Onion fair. Starting from the left hand side of the photo you will be able to identify Aston Villa Football Ground which continues along until you reach the Holt Public House. Villa Park was bought outright by Aston Villa Football Club in 1911. Charlie from Billesley recalls attending Aston Villa Football Ground for his first match in 1948. Marie from Sutton Coldfield said ‘my husband use to stand at the Holt End at Aston Villa, although he was an arsenal fan. He would phone my brother up to tease him every time Arsenal played them and won’. The Onion Fair was an annual travelling fun fair that had been popular in Birmingham since the 16th century.